Doggy Savvy’s free newsletter is low volume, we never share your email address with anyone, and you can unsubscribe at any time. 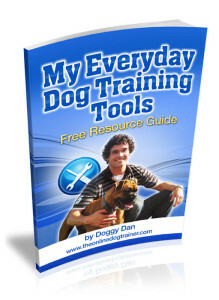 You’ll also receive a free copy of “My Everyday Dog Training Tools” by Doggy Dan. Inside every dog is a great dog. Don’t you owe it to yourself and your dog to develop your relationship to it’s full potential? Just fill out the signup form above and let’s get started!